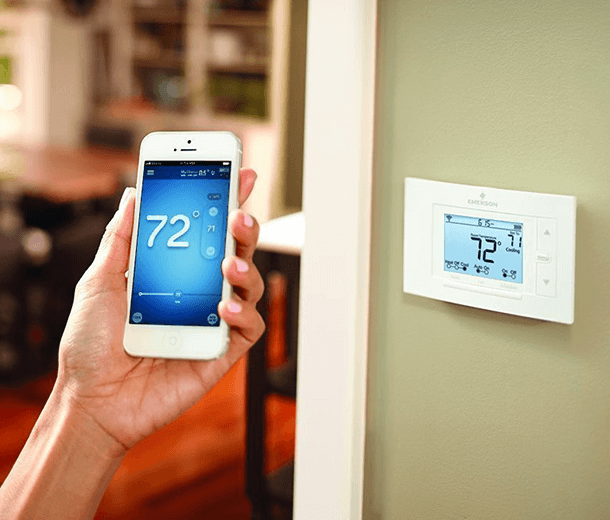 A wifi or smart thermostat is more than just convenient; used wisely, it can save energy (and money)! It also offers the potential for some cool integrations. Whether you are in a different room of your home, a different city, or even a different country, you can control the temperature of your home by the simple use of an app! Make this a DIY project or hire a professional- either way, installation of your smart or wifi thermostat should be a hassle-free process. If you have a standard furnace, air conditioner or heat pump, your system is likely compatible with a wifi thermostat. In addition, many of the latest thermostats can sync with and complement your other smart home technology, including the Amazon Echo! Common in most models, a 7-day temperature scheduling option helps reduce wasteful heating and cooling when no one is home. Depending on the thermostat, you may also have access to analyze and compare your system usage over time! These features can help save money. Some utility companies not only offer rebates for new HVAC systems, but also for upgrading to a wifi or smart thermostat! Contact your local representative to learn more about rebates available in your area; you could receive up to $100! With all of the incentives listed above, it's easy to understand why so many people are making the switch to using this new technology! Ready for a wifi thermostat? Let Logan Services help!